Come join Adam Huebner for our 14th annual Holiday Tennis Camp for a full week of tennis, fun and games while improving your tennis skills. 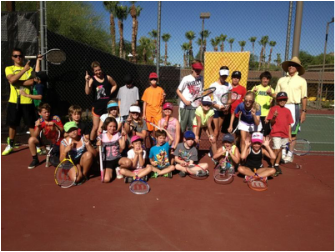 This camp is designed for the beginner to novice player who want to learn or refresh their basic skills. On Saturday, participants will be taught the modern forehand and backhand ground-stroke. This means that they will first be taught the proper grip and then the correct phases of the swing which include the back-swing, loading, contact point and follow through. Player will then hit hundreds of balls on the Playmate ball machine to reinforce these new skills. At the end of the afternoon session, students will be video taped for analysis and correction. On Sunday, players will learn the serve, be video taped again for analysis and correction, and then return to the courts for review of ground-strokes with added ball positioning and footwork skills. At the end of the camp, players will have a much greater awareness, understanding and confidence of how to properly hit the ball. Plus, you will have developed some new friendships and practice partners along the way.